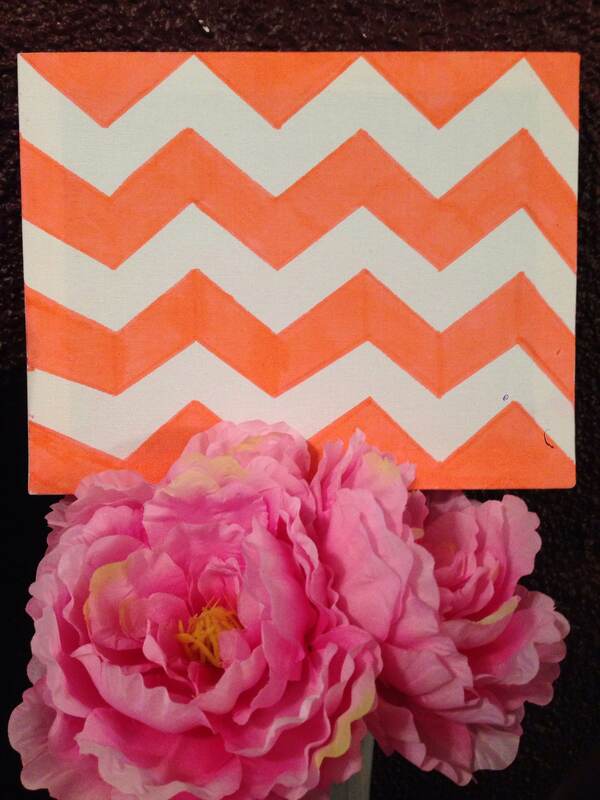 Finding cute and affordable home decor can be difficult, so I decided I would try to make some of my own. This is also a great last minute gift to make for your Valentine. 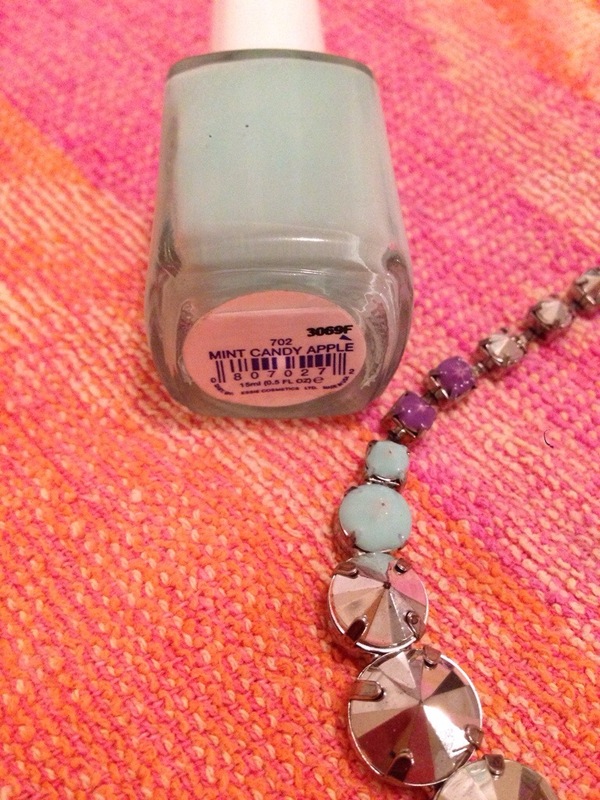 I bought all of the materials I needed from the dollar store and Walmart, so it was totally inexpensive! 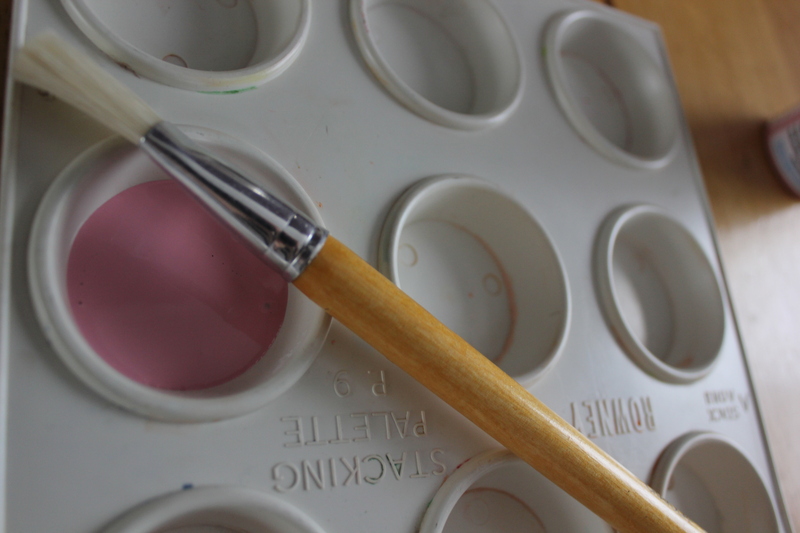 Pour some of your paint on the palette. 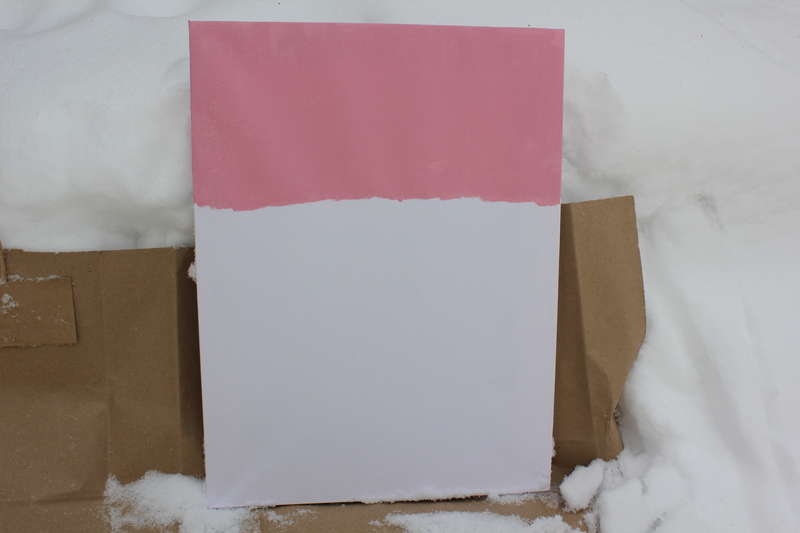 Paint about 1/3 of your canvas pink! 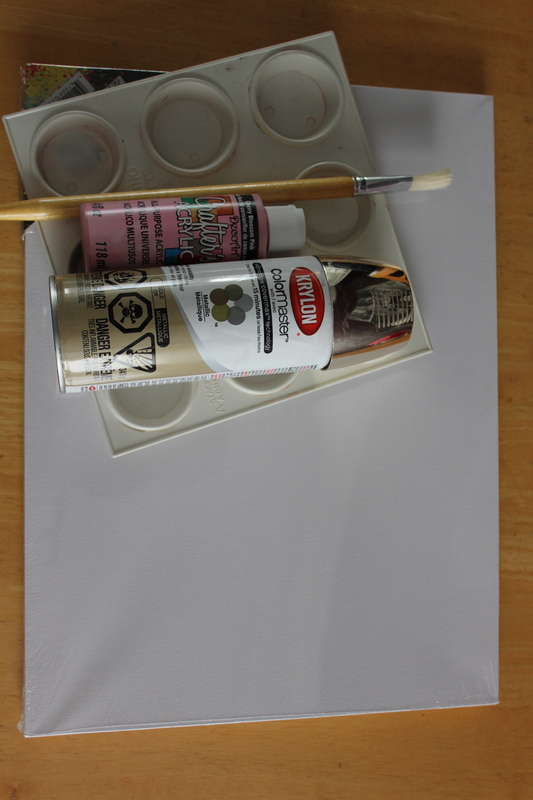 Take your canvas outside and prop it up on top of newspaper or a plastic bag. It’s best to do it on a day that isn’t crazy windy. 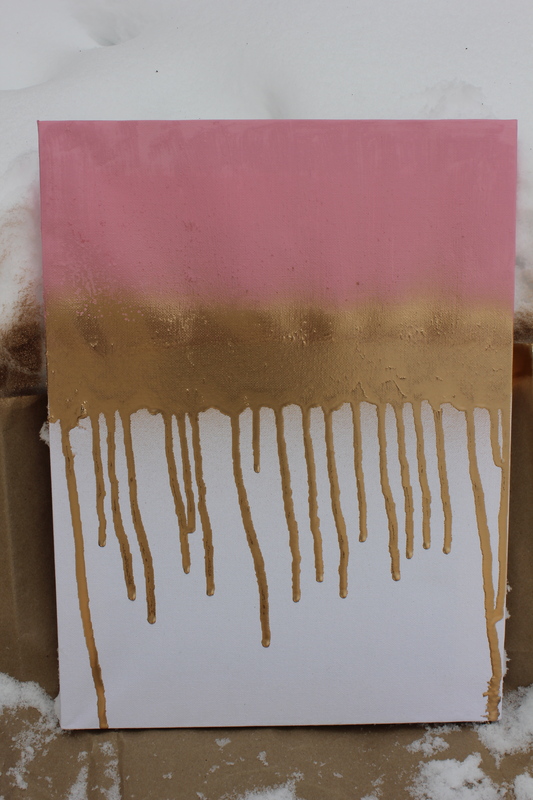 Spray two thick lines of gold paint onto the canvas. One on top of the pink paint, one just under. 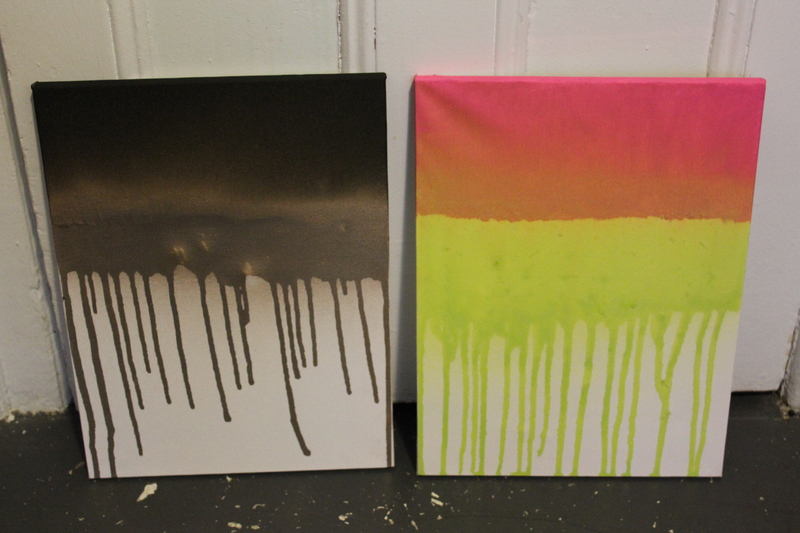 Let the paint drip down the canvas, spray again if the paint hasn’t flowed down as far as you want. Leave the canvas outside to dry. 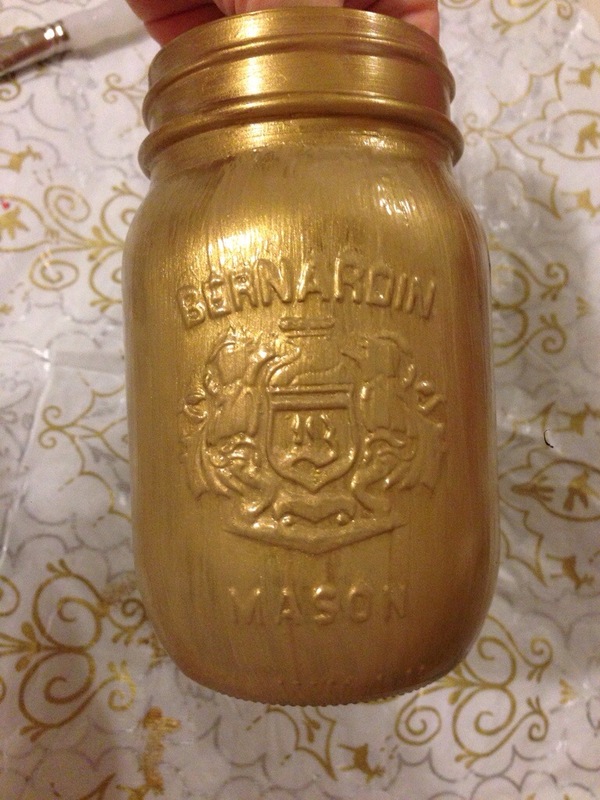 You can try with different colours of paint or spray paint! 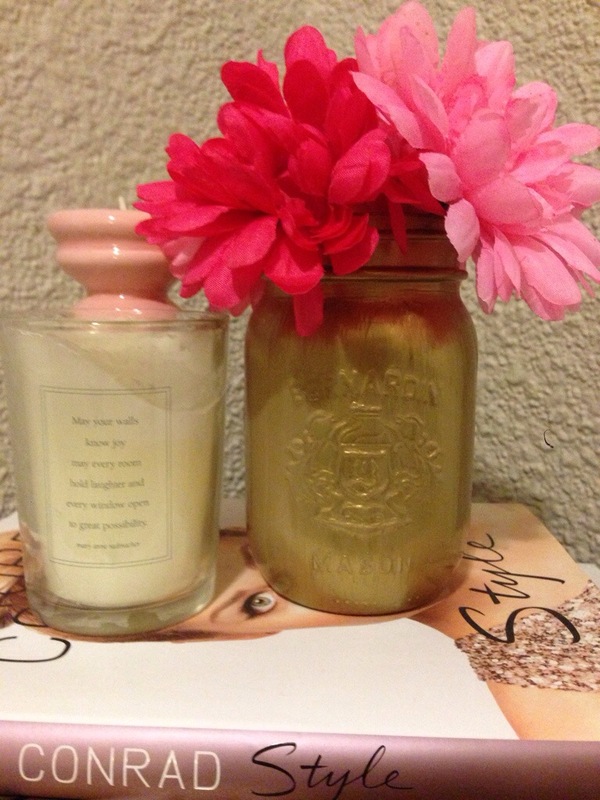 I love using mason jars for so many different things! Glasses, containers, accent pieces, and so much more – they have such a wide variety of usage! 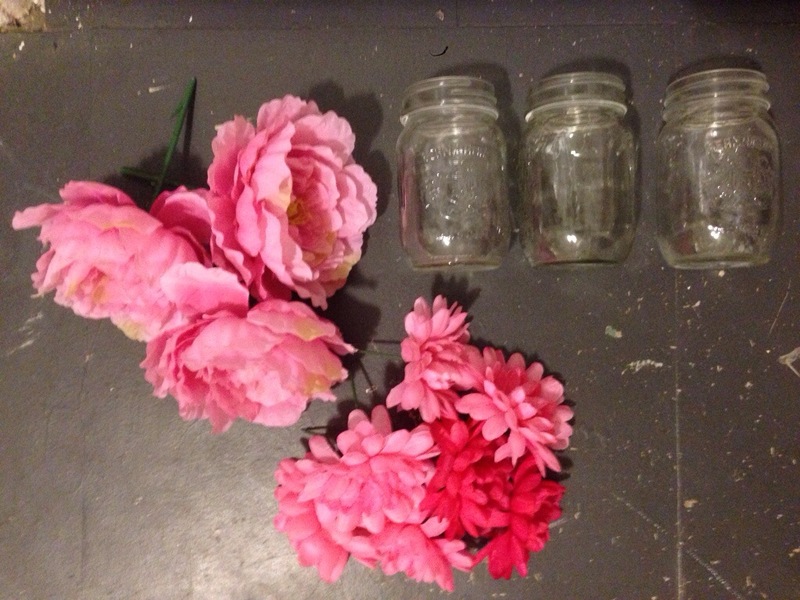 First, prepare the flowers by measuring the stem to the size of the mason jar. Then, trim stem and remove all leaves. 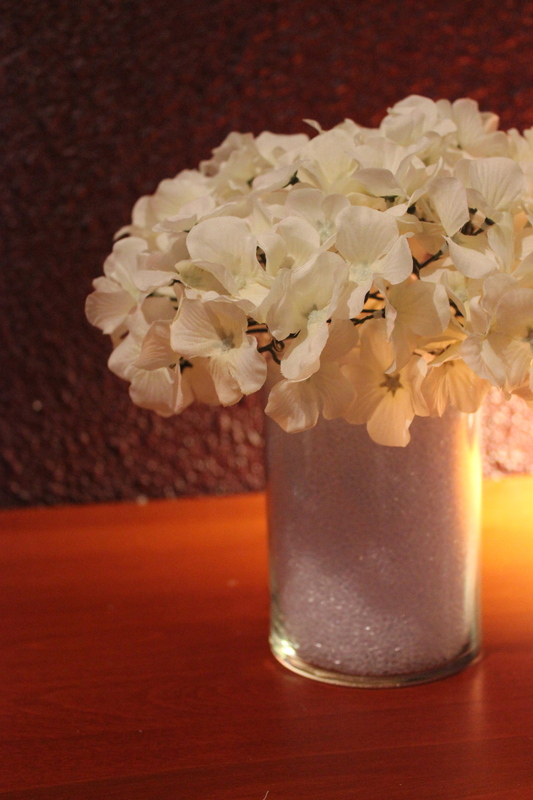 Once dry, insert your pre cut flowers into the jar – and there you go! 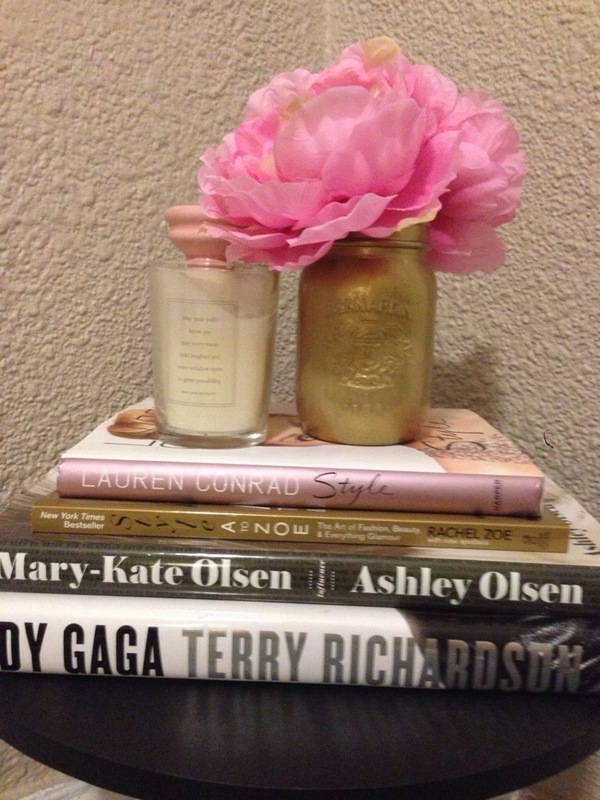 Such a chic vase, perfect for all spaces! 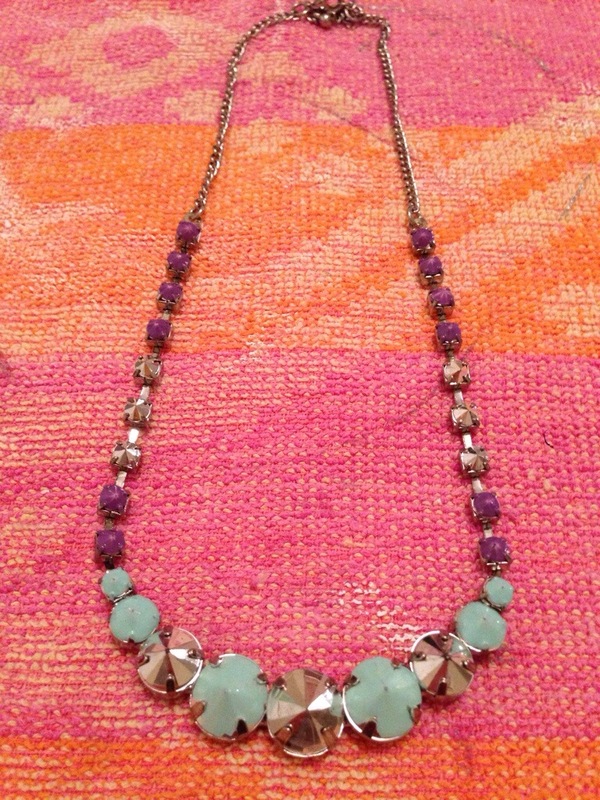 I always hate not showing love to my smaller necklaces, and neglecting them! Sometimes they’re just a little too plain for my liking. So I wanted to do something that would spruce them up and tempt me to love them all over again! 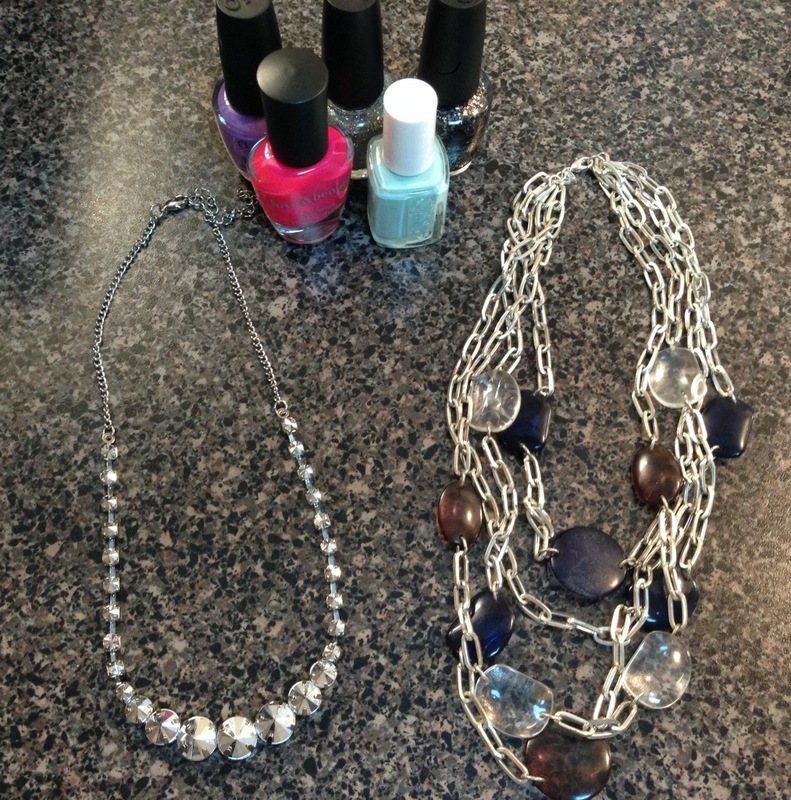 I’m going to show you guys how to take a necklace from drab to fab with something every lady has around the house! 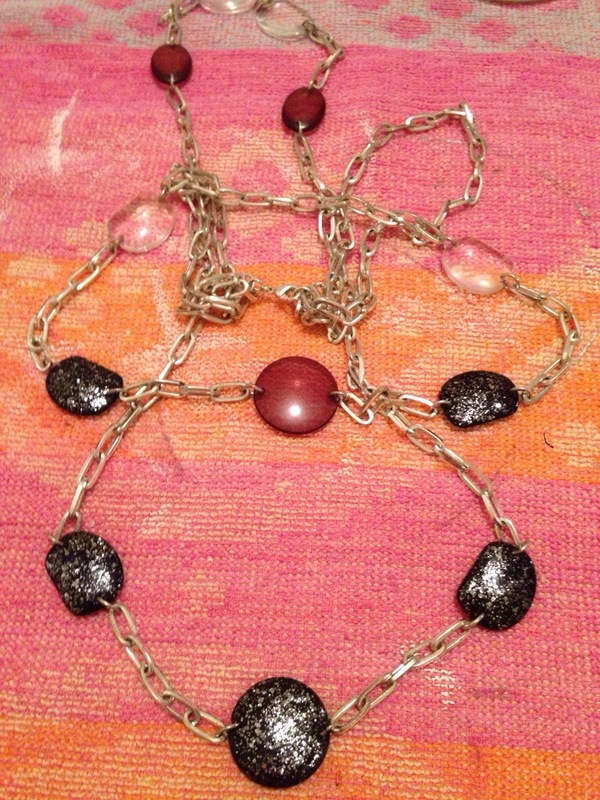 Next, begin to paint the stones! Aim to paint around the claws to give it a more fluid look – but if you don’t mind covering them, just paint away! 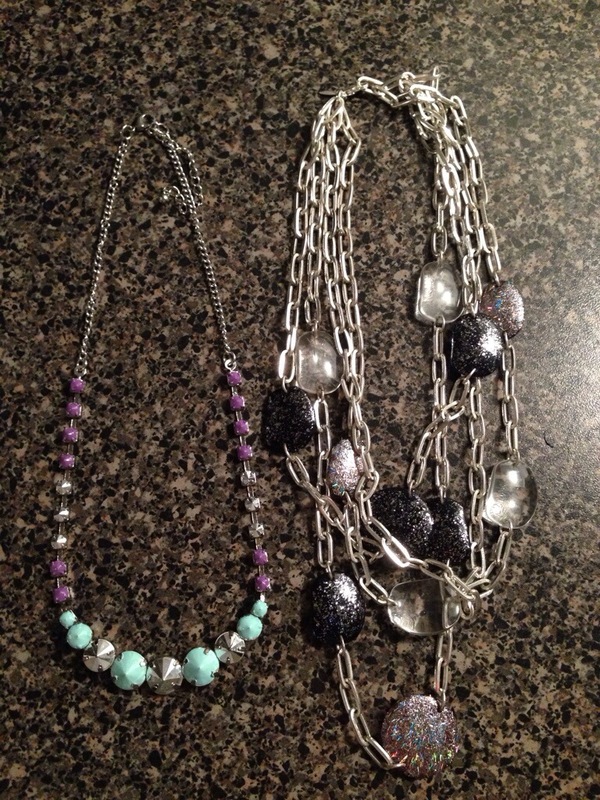 Once you feel that they are completely dry, rock your re-vamped necklaces!! I’m always looking for something chic and inexpensive to store all of my extra bobbles laying around – but I can never find something I love! 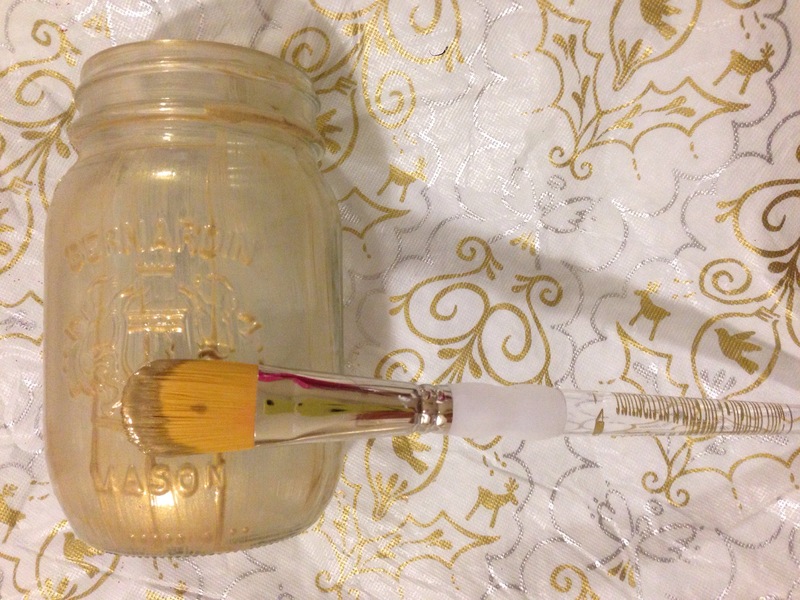 I’m going to show you guys how you can make gorgeous, easy and cheap containers for your space. 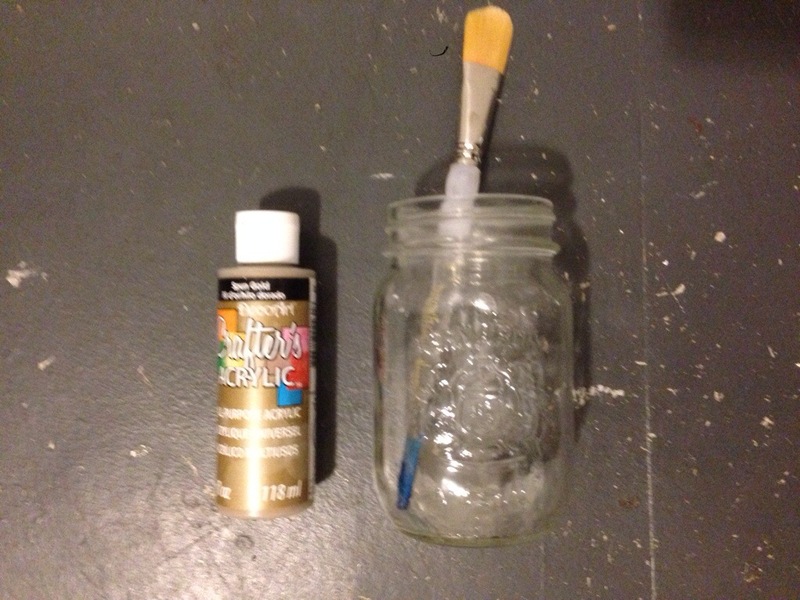 Start by removing the lids from the containers, then set up your paint and brushes. Once you’ve organized your materials, begin to paint! 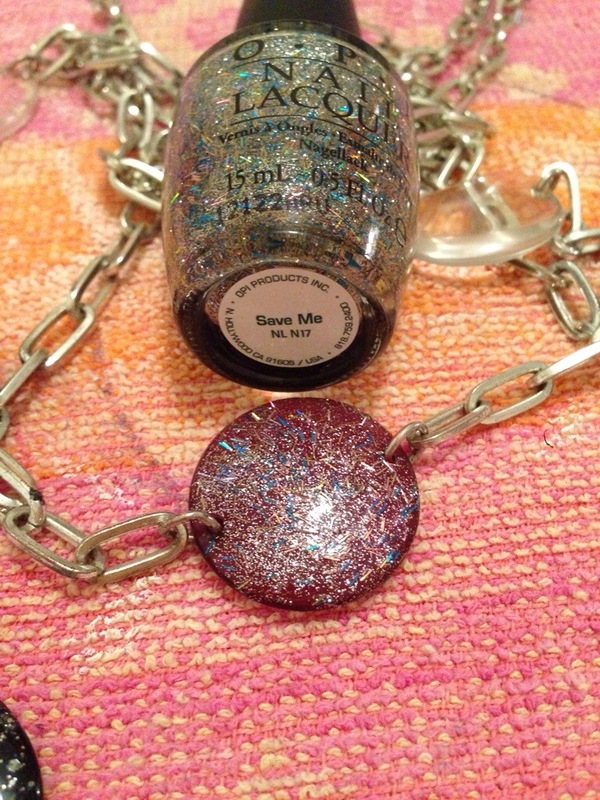 I chose to mix both colours to give the lids a more vintage-tarnish look. 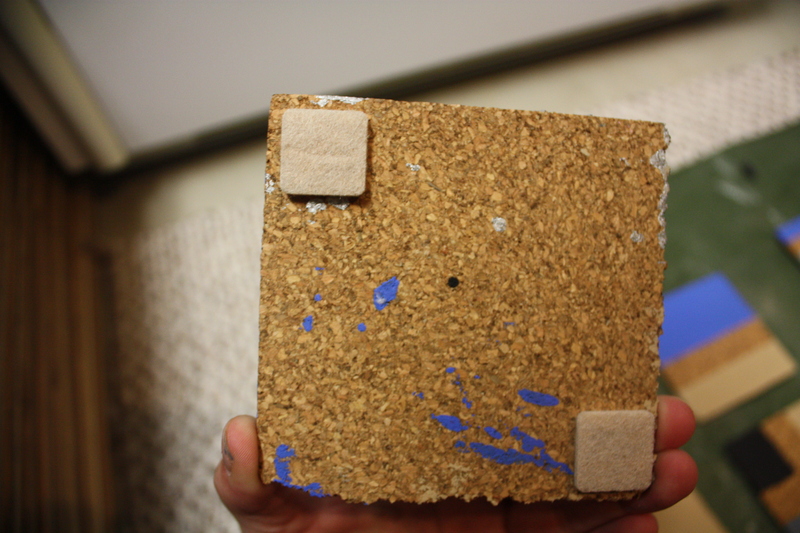 Once the paint is dry, pin point where on the lid you’ll be wanting to glue the knobs. Then, glue the bottom of the knob all the way around for a secure fit.. Hold in place for 30 seconds. 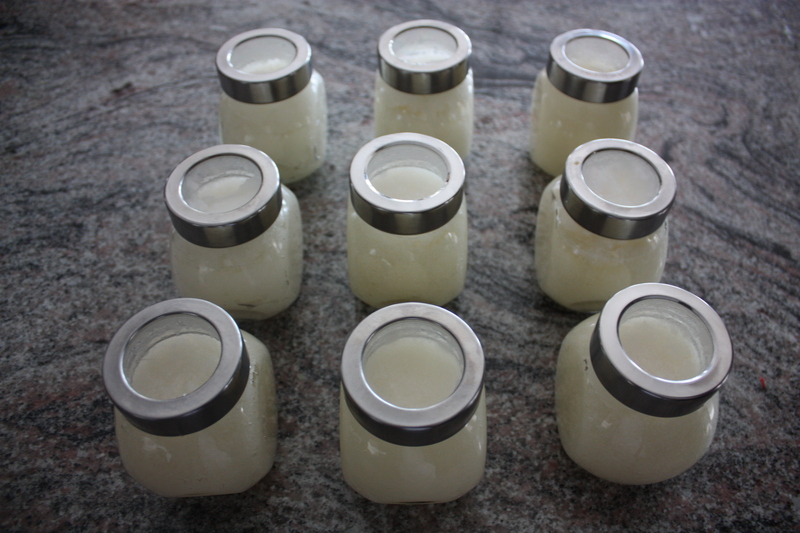 Once you’ve finished, allow for the entire lid to be completely dry before securing it back onto the glass container. And voila! Aren’t these amazing?? Perfect to spice up any little space! This D.I.Y. 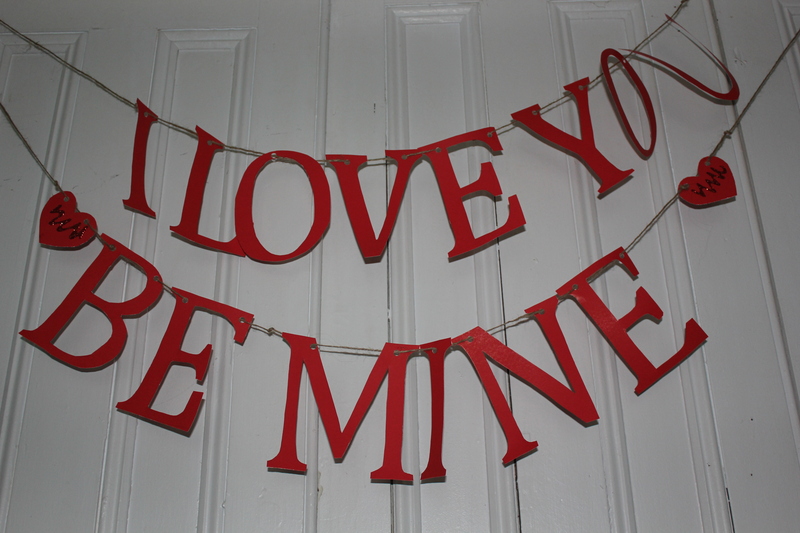 Valentine’s garland is great way to get into the spirit of love, single or attached! 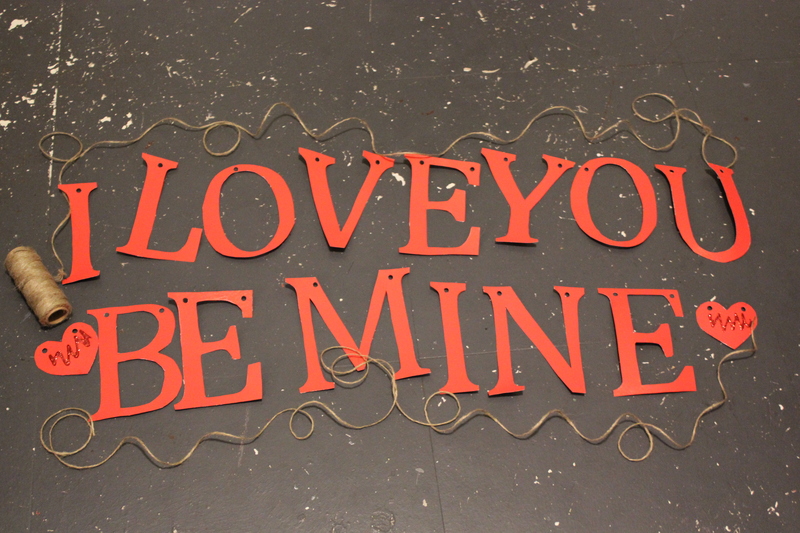 It can be used to surprise your loved one on the 14th, or you can hang it now and start welcoming the LOVE! 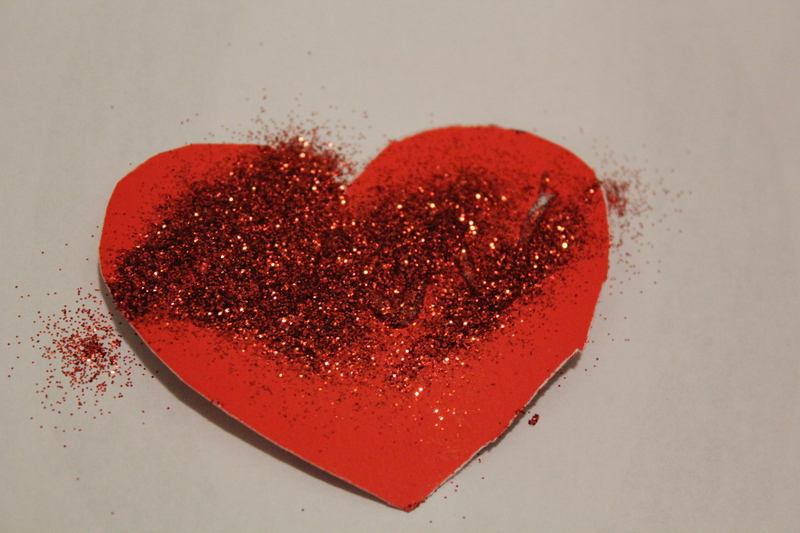 It is so easy to make and all of the materials can be found around your house & at the dollar store! I started off by printing the letters that I would need from my computer in size 650 font, fitting each letter to one page. 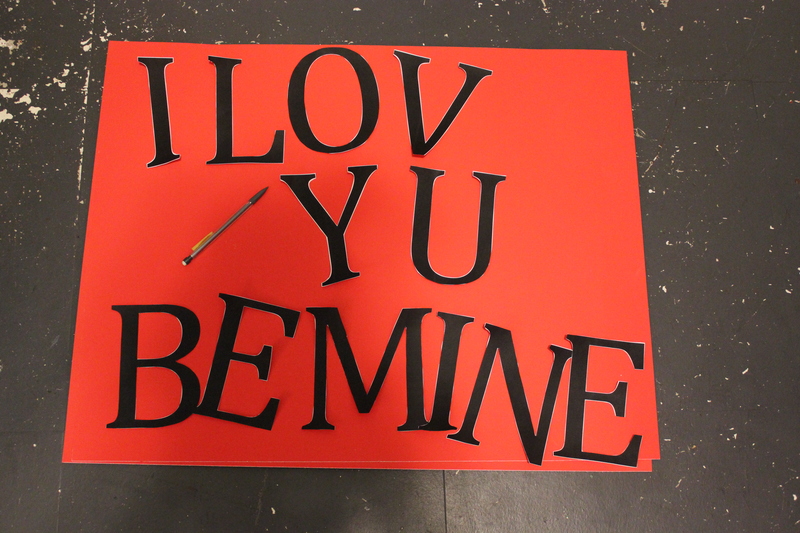 I cut the letters out from the computer paper and traced them on to the bristol board. 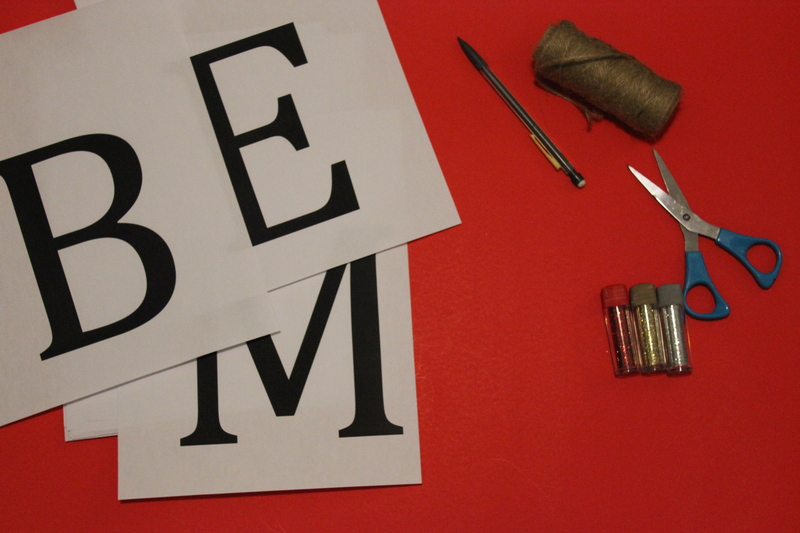 When cutting out the letters B or O, it is easier to start by cutting a small slit in the centre of the letter. After beginning to cut my letters from the bristol board, I realized it would be easier if the board was cut into rows. 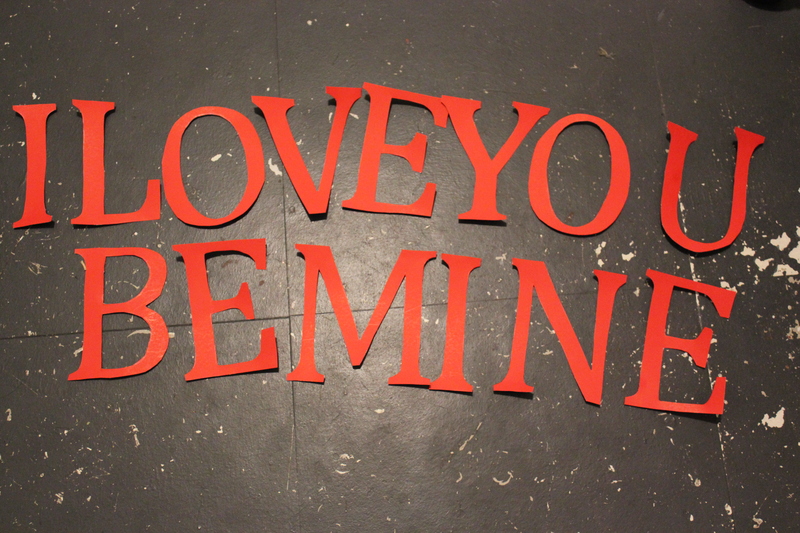 After cutting out all of your letters, lay them on the floor to see how it will look! 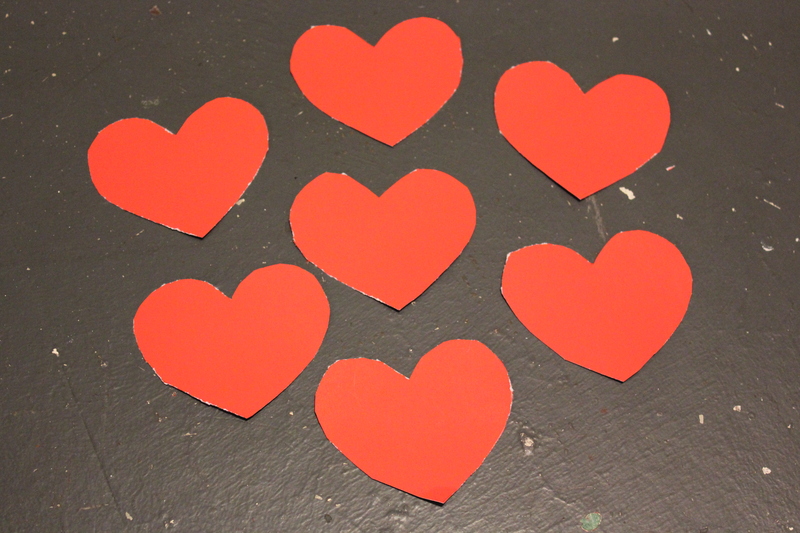 With the extra pieces of bristol board, I traced out little hearts that could separate each word on the garland. 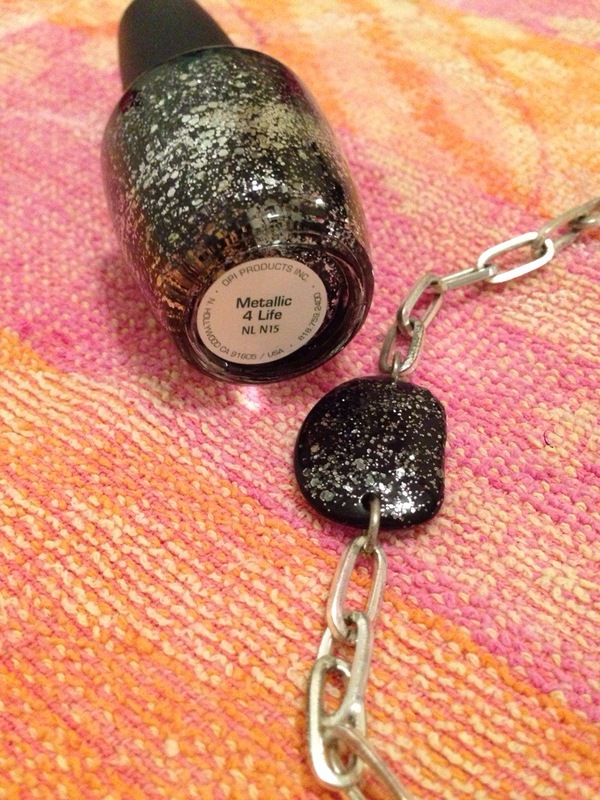 This is the time to add some sparkle! 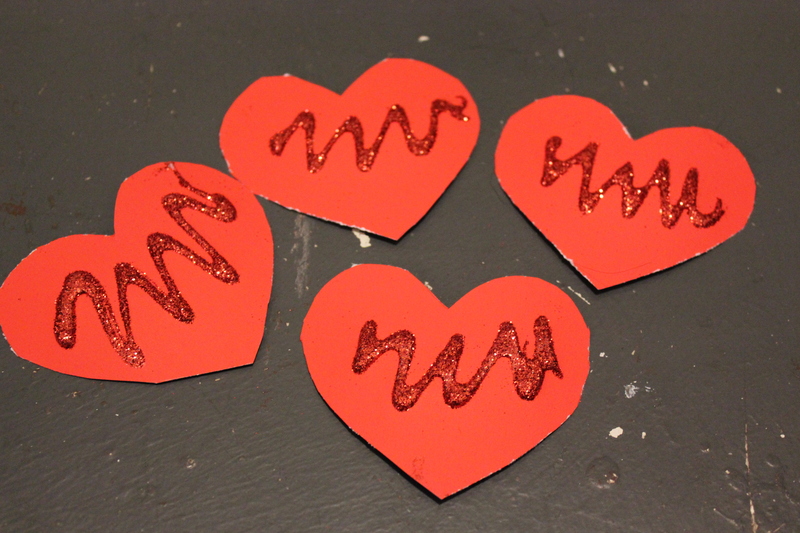 Put glue on your hearts in whatever pattern/placement you want your sparkle and shine! 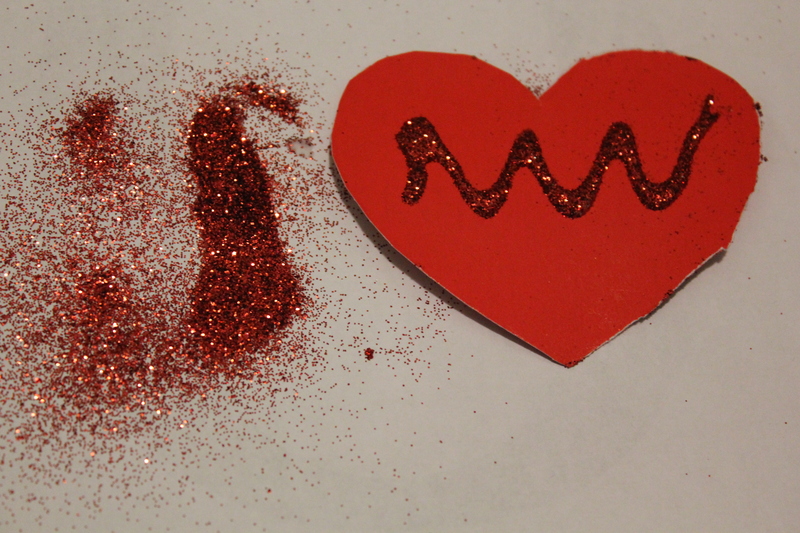 Sprinkle the sparkles over the glue! Shake off your hearts and they’re ready to go! 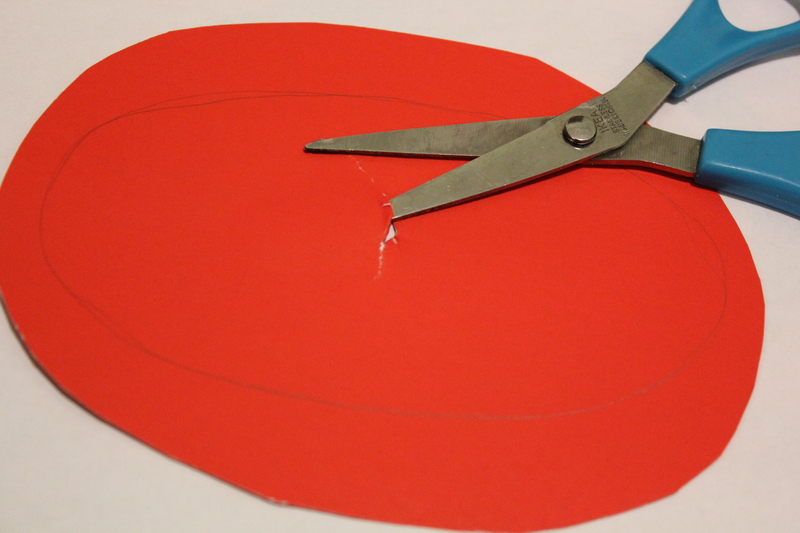 Using a hole punch or scissors, carefully punch a single hole into the top of each letter. Measure out how much twine you will need, leaving a bit extra on each end. 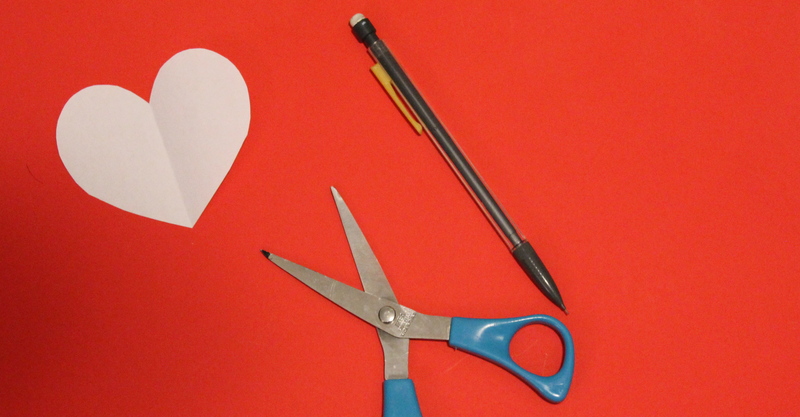 Tie a loose knot at the end of your twine, where you want the last letter (or heart) to sit. 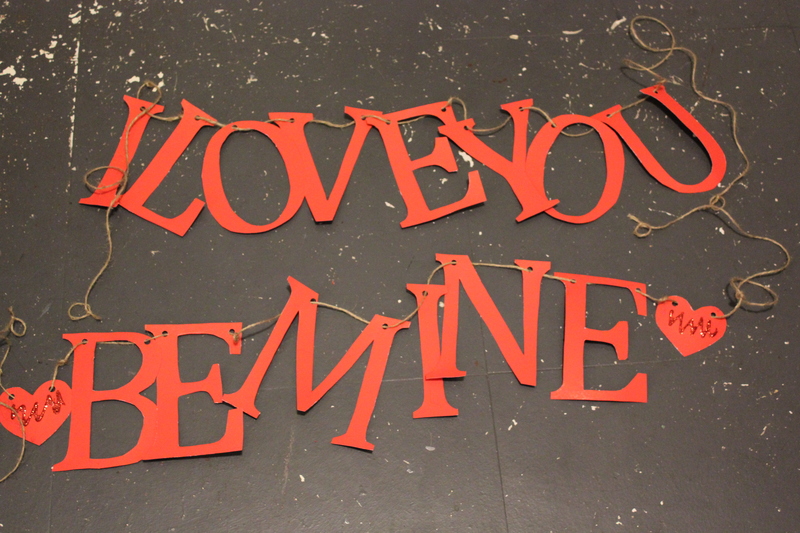 Start adding your letters and tie a loose knot in between each word. 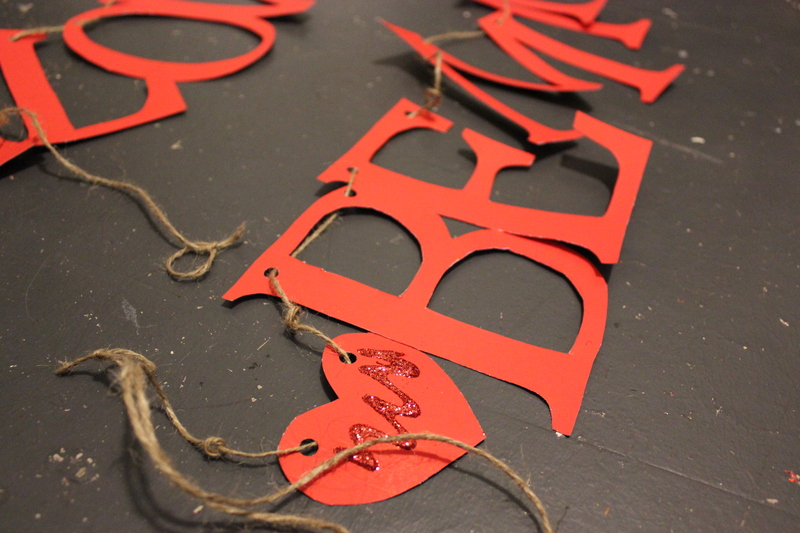 When all of your letters and hearts are on, tie a loose knot at the end to hold it all together! Now your garland is ready to be hung! 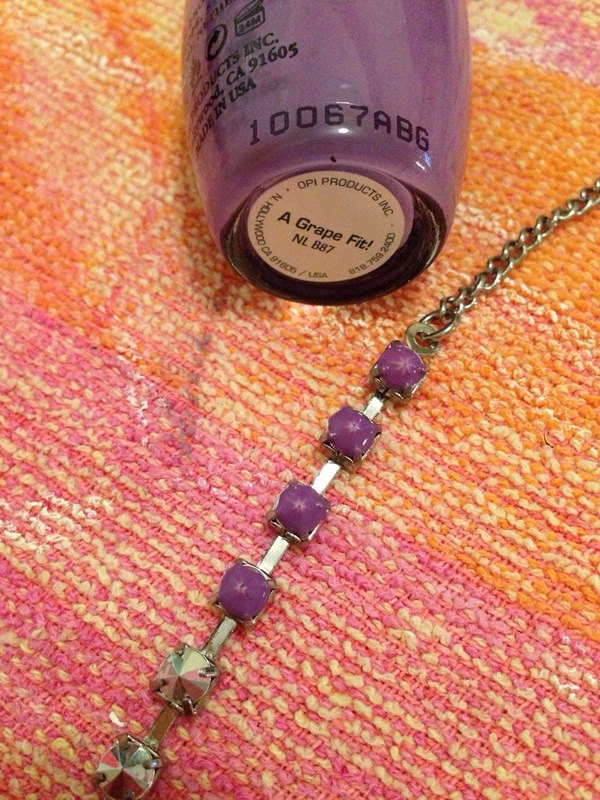 These are a really cute and quick D.I.Y. 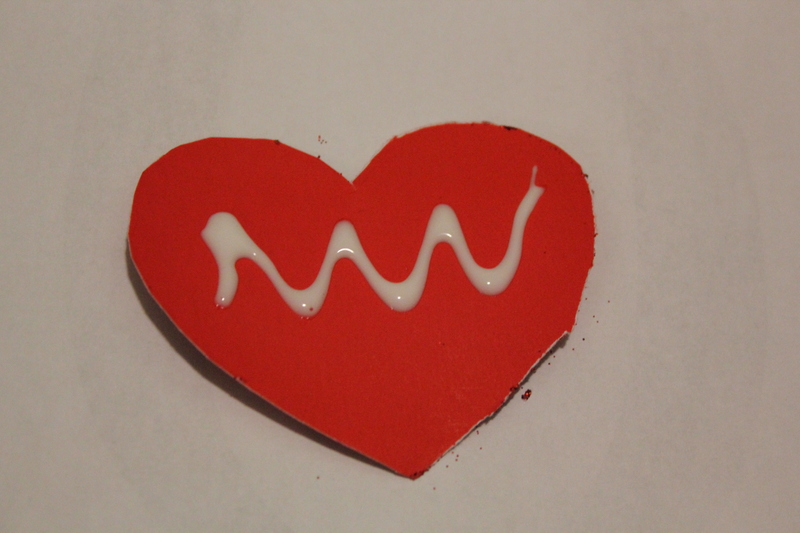 gift that is both inexpensive and easy to make. 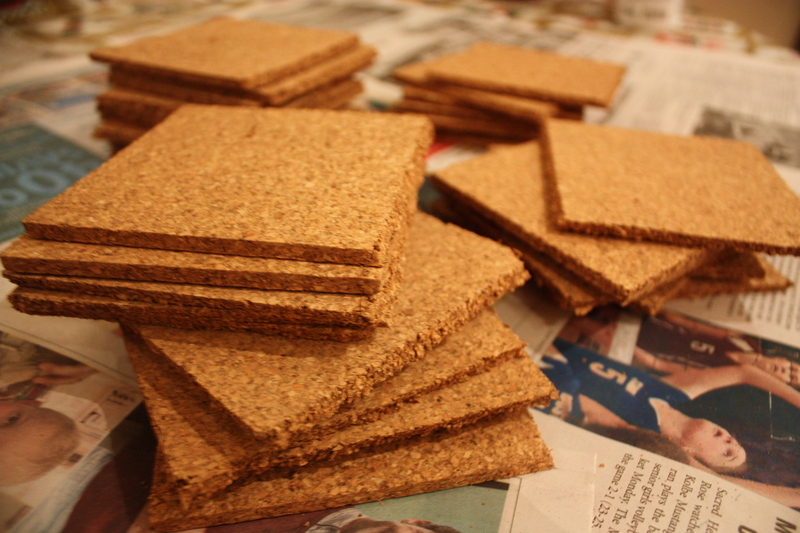 The cork coasters are good for a holiday stocking stuffer or for a fun house warming gift- the colours can be adjusted to suit either a man or a woman! 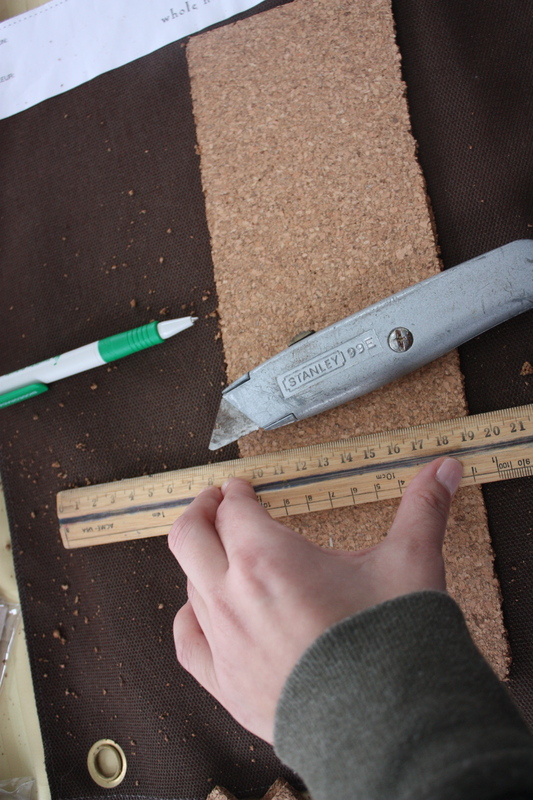 First, if you are working with cork tiles, measure them with a ruler to the size you want your coaster ( mine were 10cm x 10cm). 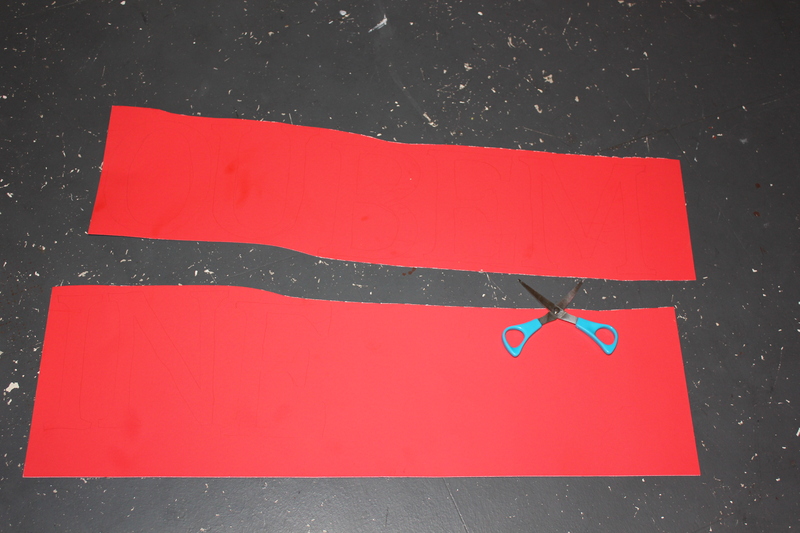 Mark the measurements with a pen and cut out the squares with scissors or an exacto knife. 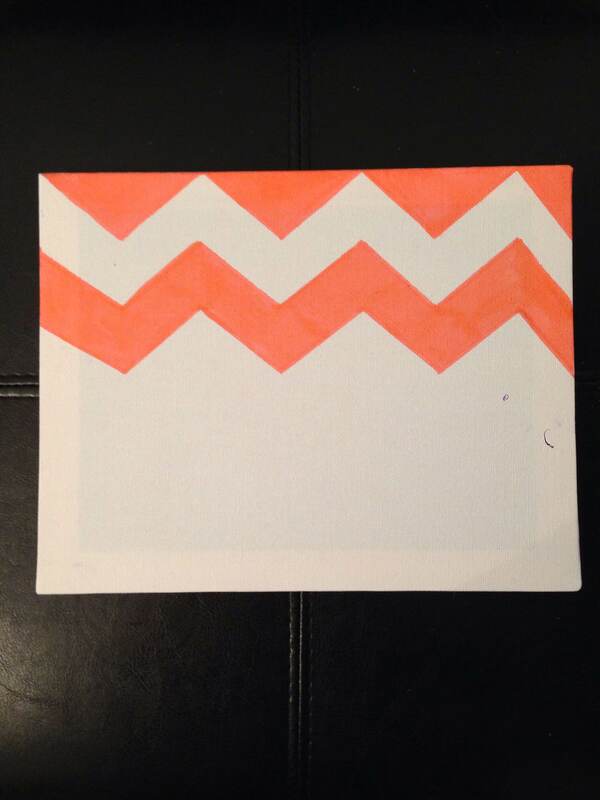 Use your painting tape to create your design. 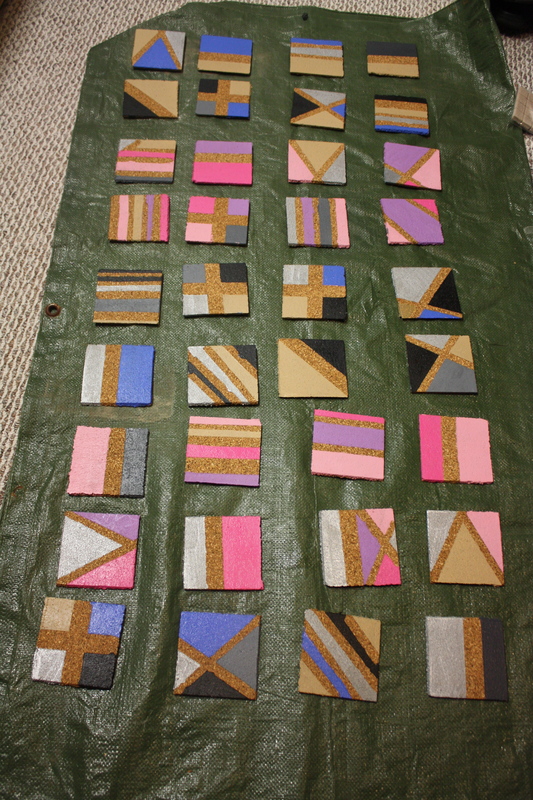 I used variations of stripes, crosses, and colour blocks and also cut some of the pieces of tape to get thinner and thicker stripes. Make sure the tape is flat(without bubbles) so that no paint goes under the tape later. 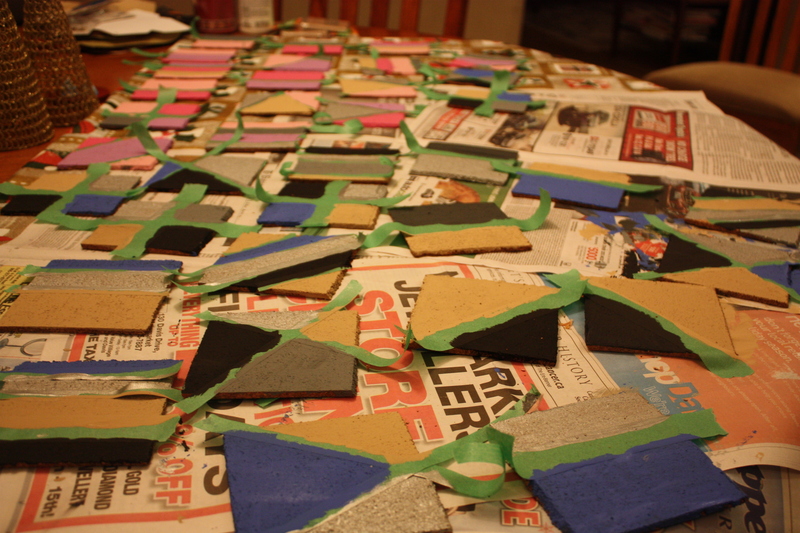 Once you are happy with your taping, you can paint the different colours onto the cork coasters. Let them sit aside until the paint is dry. Once the paint is completely dry bring your coasters into a well ventilated area where they can sit to dry for about an hour ( I went into the garage). 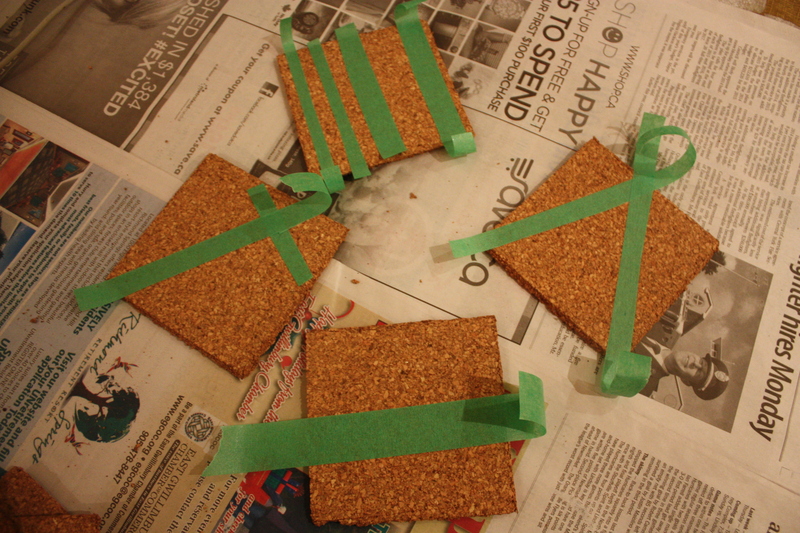 Lay the coasters down flat and spray them with the water-resistant finish (I did three coats). Once the coasters have sat to dry, you can put felt on the bottoms so they are safe for any surface! 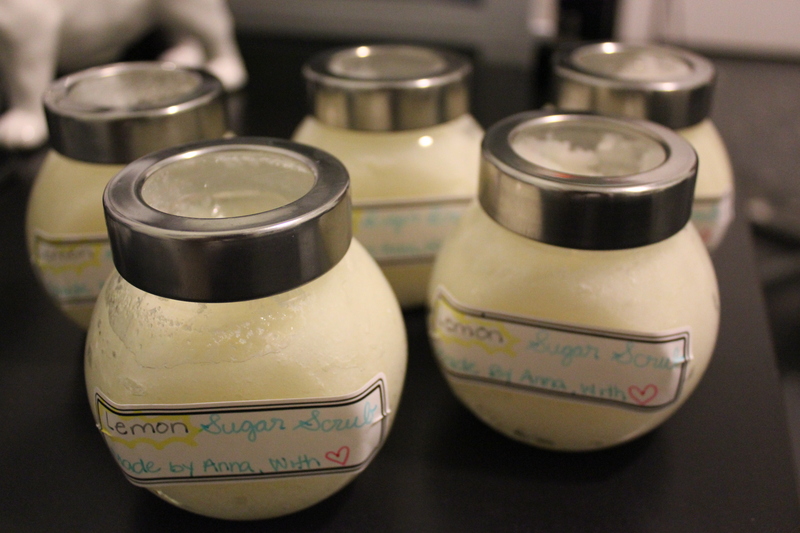 Lemon Sugar Scrub is a really easy and quick D.IY. that uses only 3 ingredients. It’s a gift that both men and women accept happily! 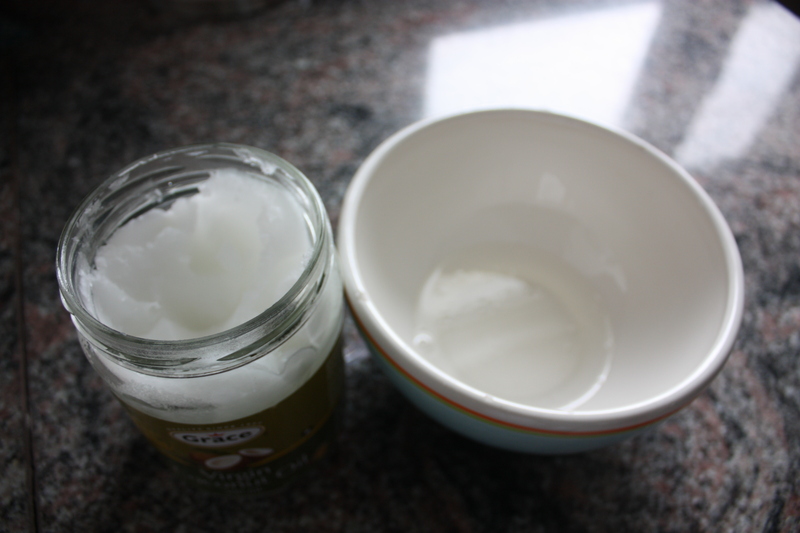 The sugar in the scrub exfoliates away dead and dry skin, and the coconut oil leaves your skin feeling soft and moisturized. 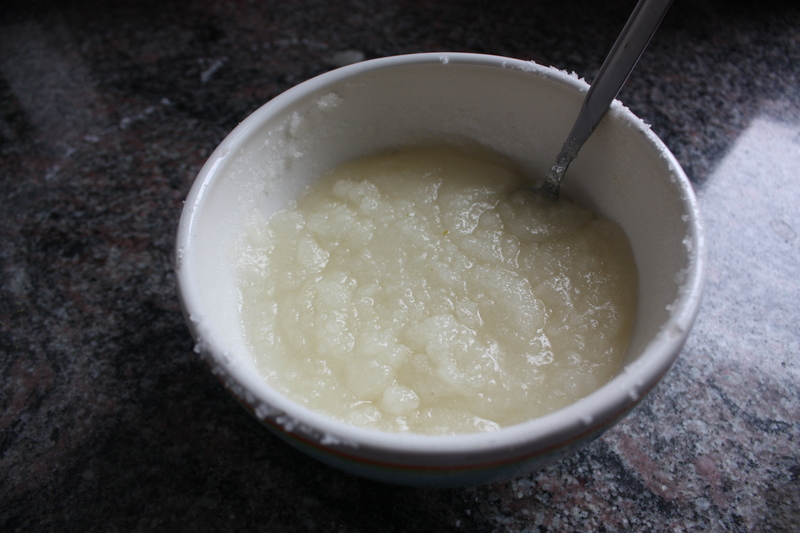 First microwave 1/4 cup of coconut oil for about 45 seconds. If the oil doesn’t fully melt try stirring it or microwave for an additional 15-30 seconds. Be careful when taking it out not to burn yourself. 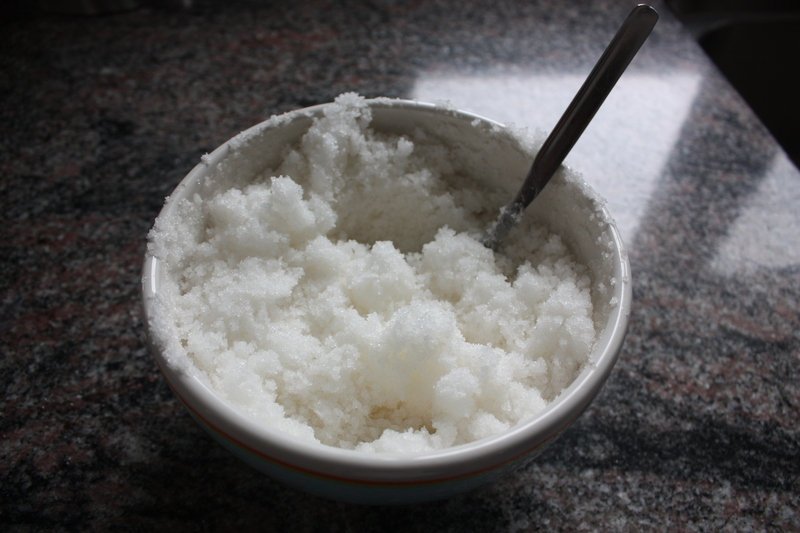 Pour the coconut oil over 2 cups of the granulated sugar. 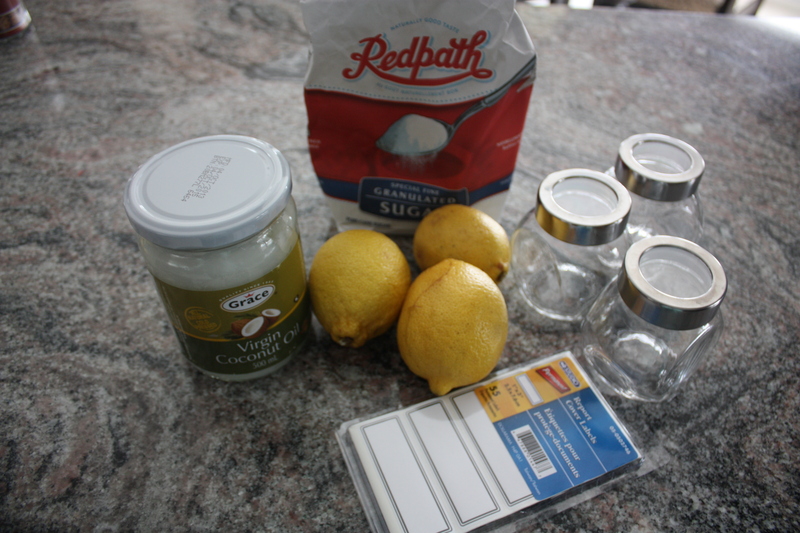 Mix the ingredients well and then add the additional 1/2 cup of sugar. Remove the zest and juice from one lemon. 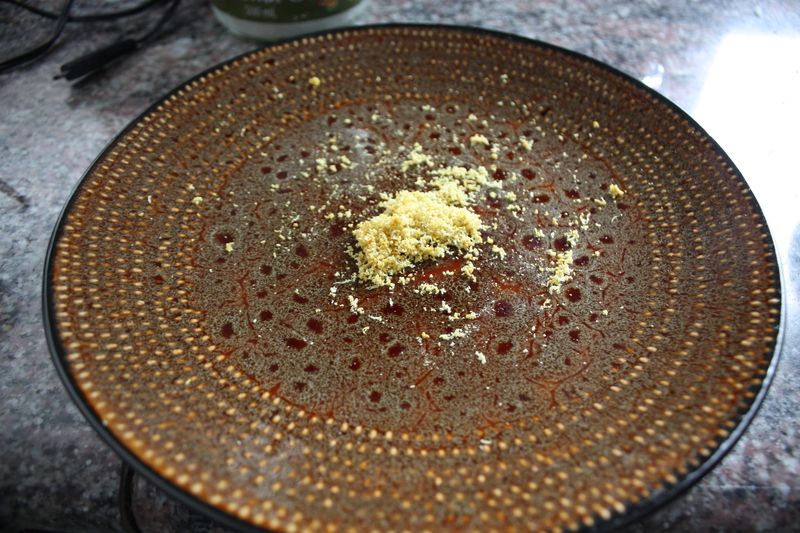 Pour the lemon juice and zest into the sugar/coconut mix and mix well. 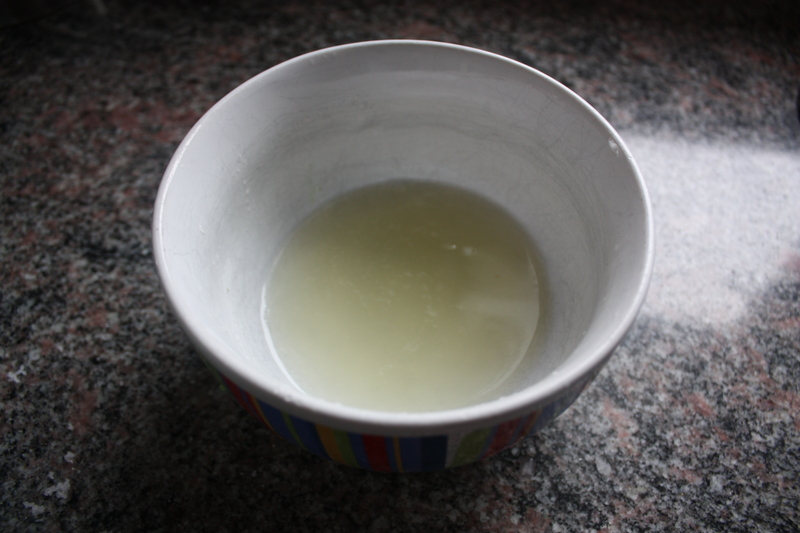 You don’t want the mix to be too dry, if it is add more lemon juice (or a touch of oil if you used all your lemon). 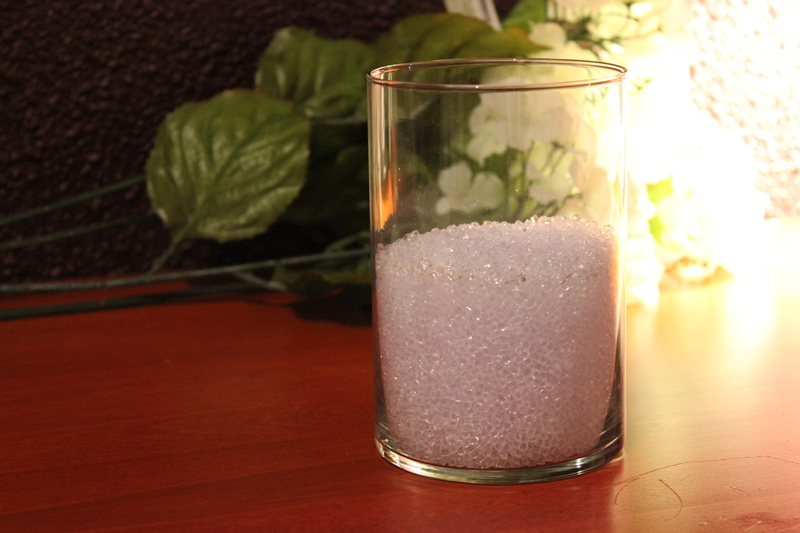 I bought small glass jars from the dollar store that I could put the sugar scrub in. 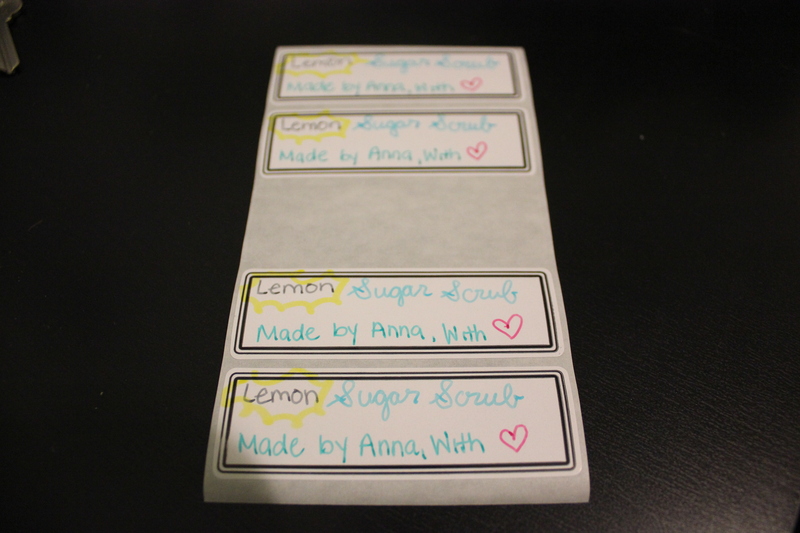 I made custom labels for the jars from blank folder labels that I also purchased at the dollar store. You can also add cute ribbon or bows to customize for any occasion! 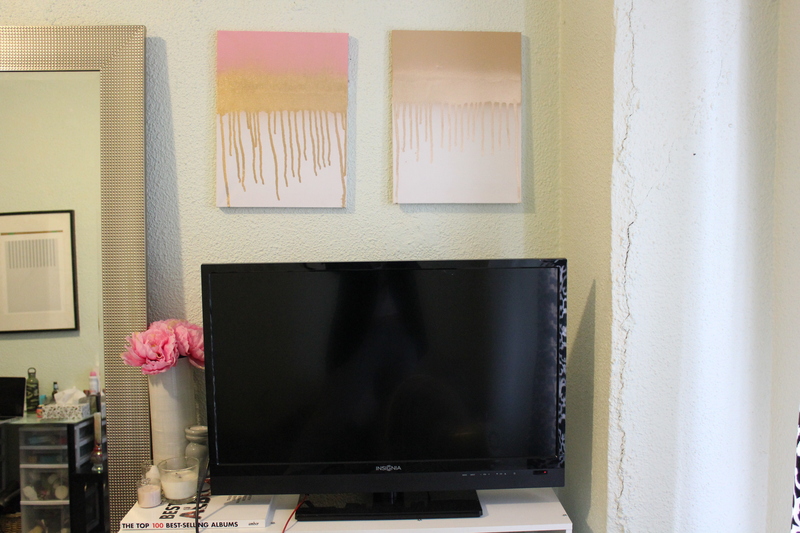 So lately I’ve found that I tend to really change my mind when it comes to home decor; and we all know that it isn’t affordable when it happens often. So I started to look into ways that I could change the look of a room, without having to spend hundreds of dollars. 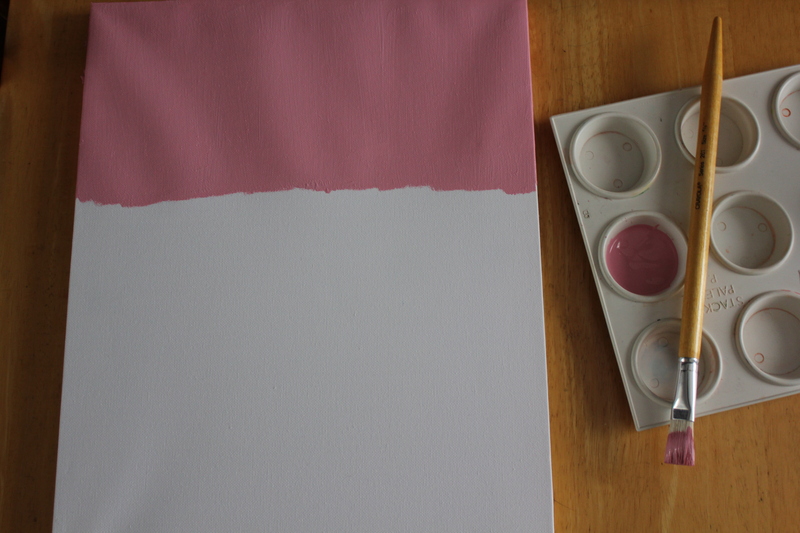 I’ve really started to fall in love with pretty DIY canvas’ that are cheap and easy to do, while still looking chic and effortless. This lead me to spark up the idea to use a brand like Missoni, take their iconic chevron print, and turn it into artwork. This DIY is super simplistic and has so many colour and size options, you could make as many as your little heart desires. First, choose the colour you will be using. 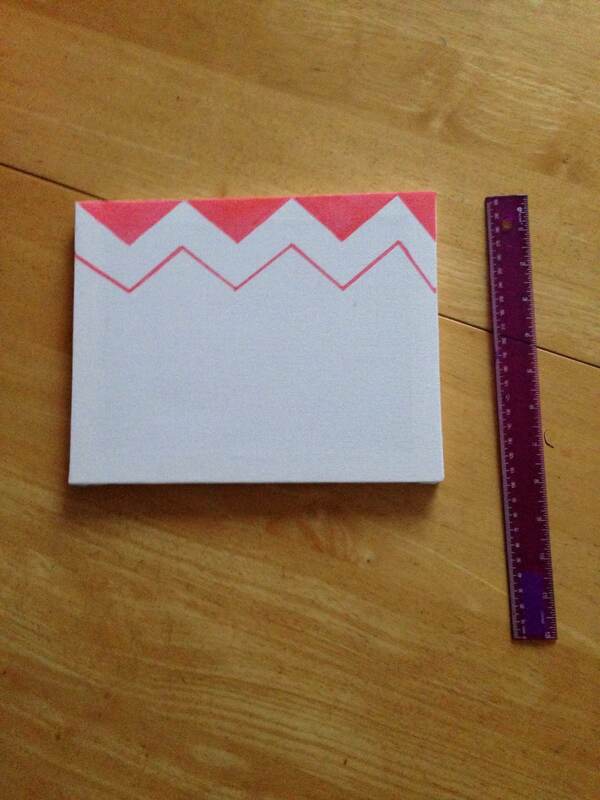 Next, measure out the size of the chevron you will be drawing. I chose to make mine 1-1/2 inches on each side. 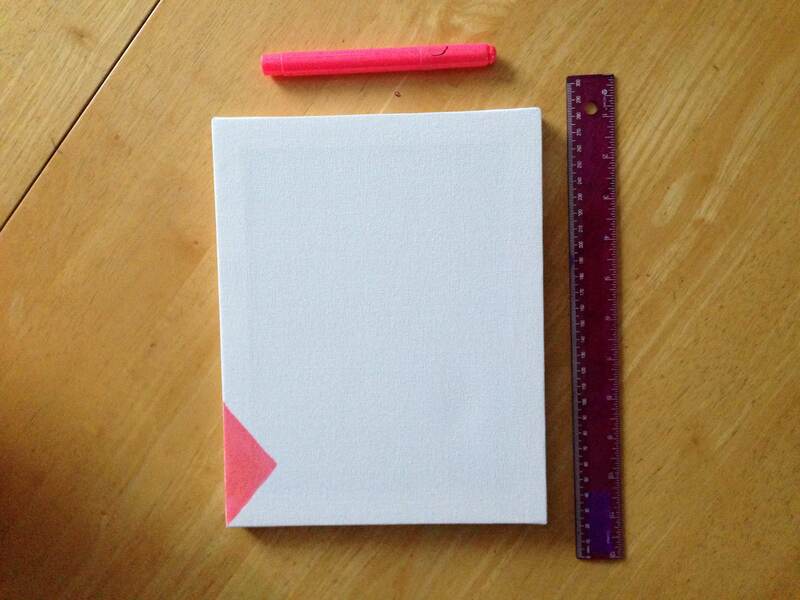 Once you draw the first triangle, fill out the rest of the canvas with the same size triangles across the top. Next, draw a line beneath mimicking the print above. This shape will be filling out your white space. Continue the same pattern throughout the canvas until there is no longer any space left. Try and maintain each row as the same size, if they are slightly off, it’s okay! And voila! The finished product. Such a classic and sophisticated print, perfect for any room! So I have a huge thing for interior design, and love when I can come across simplistic and fun ideas that can easily brighten up any space. I have a ton of these flower arrangements throughout my house, so I thought it would be cool to share this with everyone! A glass vase – The shape is according to preference, so to each their own! 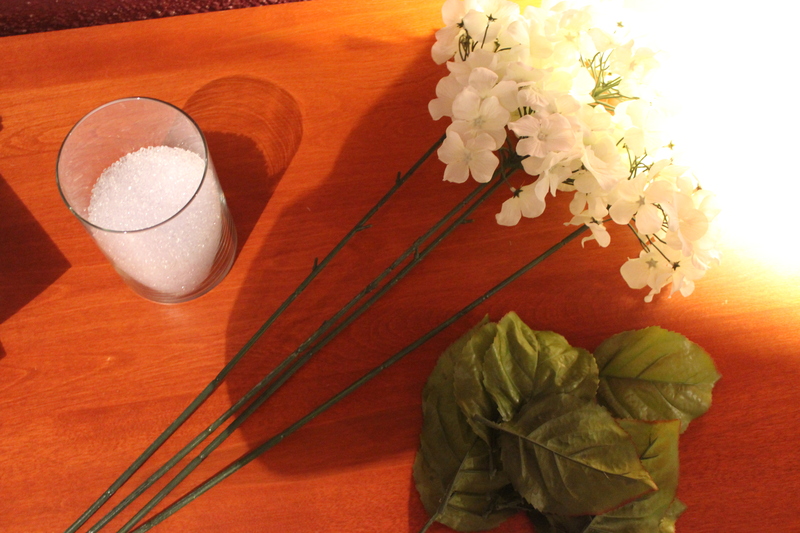 Plastic flowers – These as well are according to taste – I chose Hydrangeas. 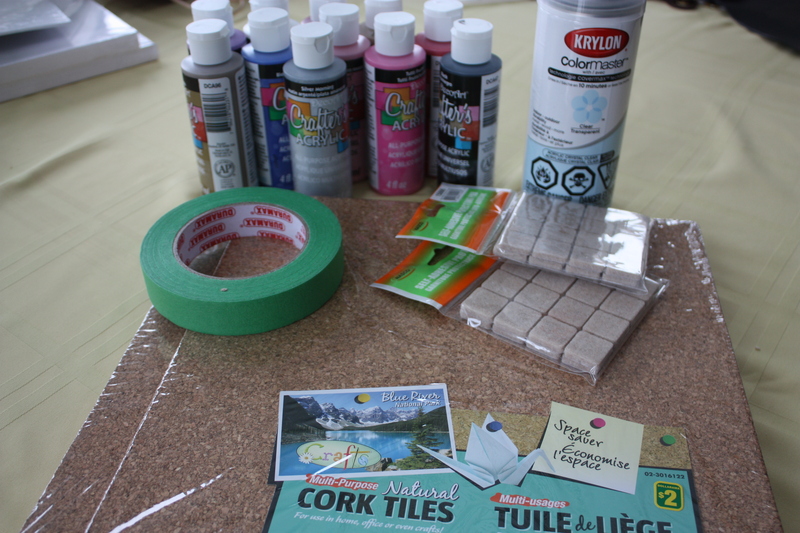 All of these items can be acquired at your local dollar store, or craft store! First, fill the glass according to preference. I chose to fill it almost to the top, in order to cover the stems in the third step. 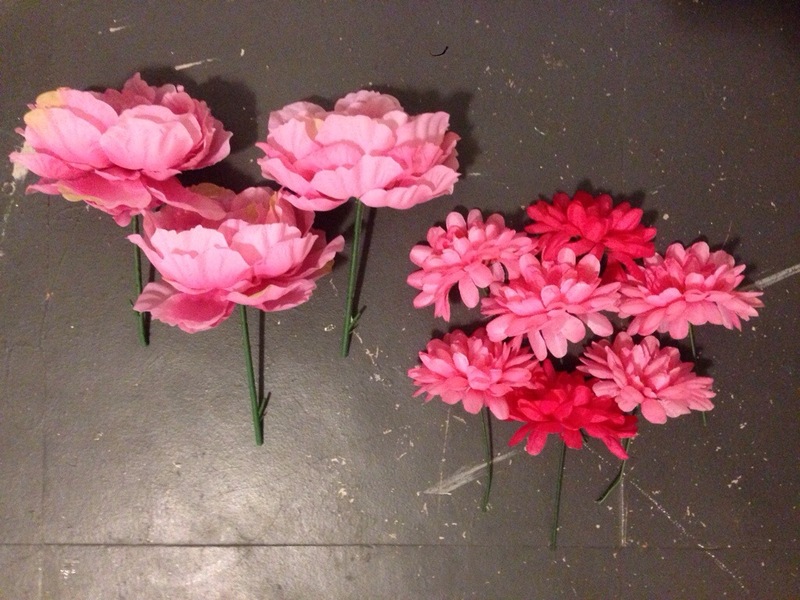 Next, remove the petals. This is also done according to preference. I prefer a more simplistic look, but they can also be left on. Next, trim the stems. This is done according to the size of the vase, and how much you prefer to have the stem showing. I chose to make it the length of the vase. 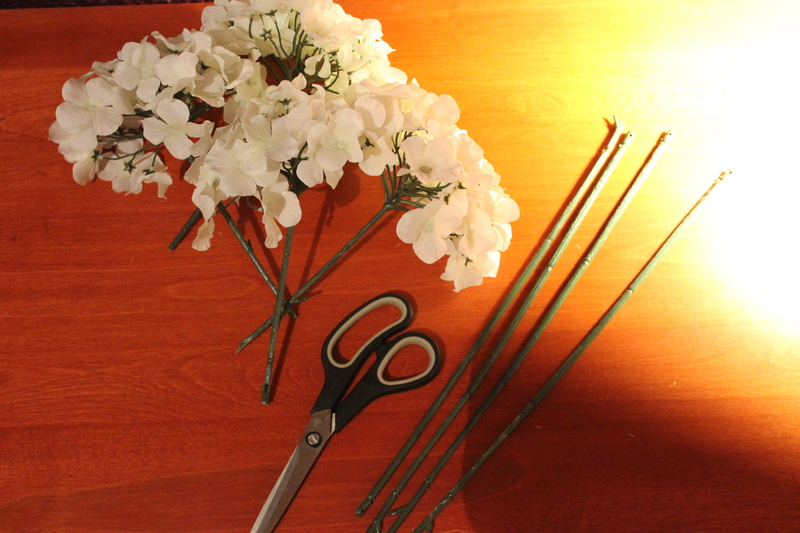 Lastly, place your trimmed flowers into the vase and – voila! 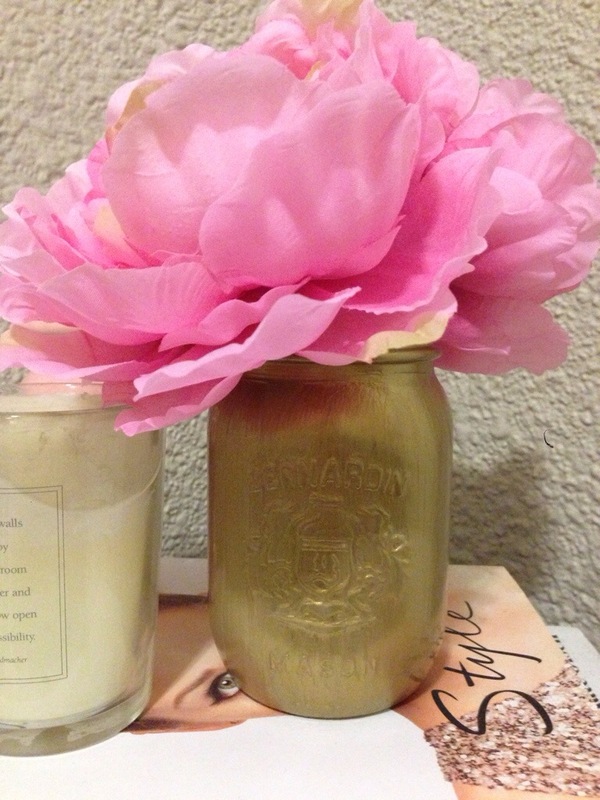 Cute, easy and fun to make, while brightening up your space.